The resolution (S.Res. 633) follows a companion in the House introduced this summer with 190 signatures from members of both parties, including more than three dozen Republicans. The measures are in response to a proposal in President Trump’s plan to reorganize government to privatize USPS, which the White House said should occur after the agency gets back on firmer financial footing. The plan has been met with widespread, and bipartisan, rebuke. McCaskill said the Postal Service was the “backbone of our rural communities” and vowed to fight against any effort to terminate its status as a government agency. 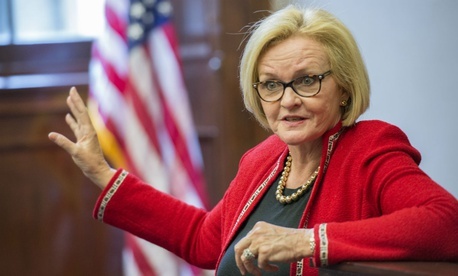 “The incentives simply aren’t there for private companies to take mail that last mile for people living in rural communities,” McCaskill said, “and I’m going to fight tooth and nail to ensure that every Missourian—whether in a small town or big city—has access to the critical services the Postal Service provides.” McCaskill earlier this year cosponsored a bipartisan bill to reform USPS by removing many of its liabilities and enabling it to pursue new lines of business, while keeping it a part of the federal government. The Trump administration has argued postal customers would be better served if USPS were not associated with the government. Trump issued his plan as a task force he created was working on a report with recommendations for fixing the cash-strapped Postal Service. That group, led by the Treasury Department, has delivered its findings to the president, but is not expected to make the report public until after the midterm elections in November. The resolution, if approved in Congress, would mark the latest in a series of actions lawmakers have taken to block pieces of Trump’s reorganization plan from taking effect. They recently sent a spending bill to Trump's desk for his signature that included explicit prohibitions on certain reform proposals.